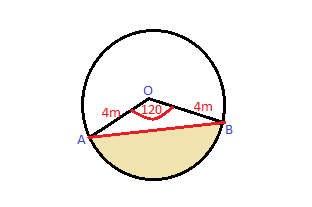 If the shaded area is the same of the area between the center of the circle and arc AB, we can use the same concept Are of a circle is pi*r^2 = 3.14*6*6 this is for the full circle. Now we have only 135/360 portion of the circle. 1/05/2011�� I have a circle with the diameter of 12 feet and and angle of the non shaded area is 150 degree. I started by finding the measure of the angle of the shaded sector to be 30 degree.